Best fall dessert (breakfast? )…like ever. OK, that’s a major exaggeration, but these are honestly just SO delicious. Asher was over the other day while I was making these and declared them the best doughnut ever… or at least that she’s ever had, cause I’m not sure she’s ever had a store-bought doughnut. Guys, that little girl may only be eight, but she certainly tells it like it is – the good, the bad and everything in between. 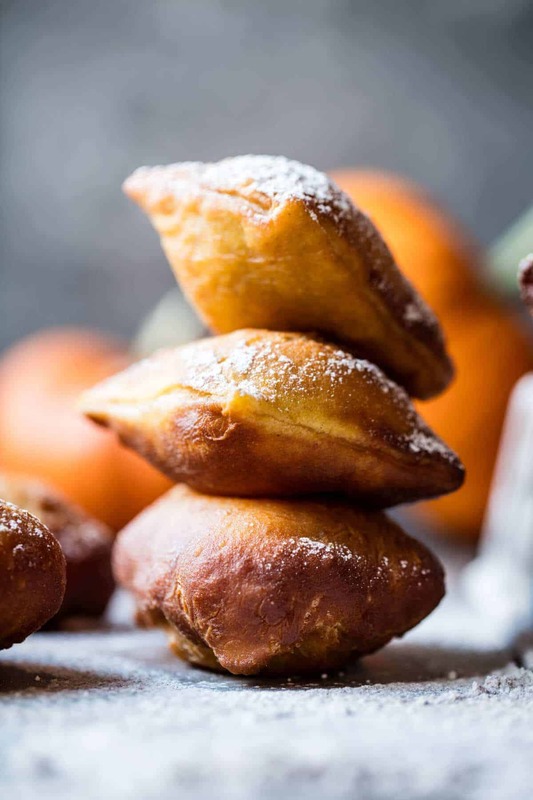 So what I’m saying here, is that there really is no doubt that these beignets are kind of incredible, and well, they should probably be on your table…no wait, in your face, at some point this weekend. AND you should probably make them again for Thanksgiving! Yes, Thanksgiving! I’m already thinking about it (only 27 days) and I’m pretty excited too! I mean, how fun would these be to serve for brunch, or a pre turkey snack, or dessert?! <– Doing. My mom will probably just skip the turkey all together and simply eat all the beignets she can. It’s how she rolls…can’t say that I blame her. Sorry for all the dramatics there, but I truly cannot help my excitement, I love these little beignets! OKok, and I maybe just watched the new Gilmore Girls trailer, and maybe almost cried. That is a lie, I didn’t almost cry because I’m not that type of person, but it is semi embarrassing how excited I am for November 25th. I’m not sure how I’m going to pull off taking all day to binge watch all four episodes, but it’s happening. And yes, these beignets are going to be my “Gilmore Girls” junk food of choice. Yummmmmm! And since we are just totally off topic here already, I feel like I should mention we have a little bit of a fox issue. Like a multiple fox issue, and way too many animals they could possible attack. We aren’t sure if they’ll go after the goats, but their kids and the chickens are for sure fair game. YIKES. Let’s hope that bright lights on the animals all night, and frequent ATV runs on the property, will scare them away. Apparently one of our neighbors higher up the mountain had all of his chickens killed. ? 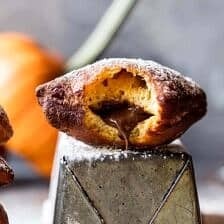 But ah, back to these Nutella stuffed pumpkin beignets!! I’ve been planning this recipe for over a month. It was one of those recipes that kind of floated into my brain and stuck. Meaning, it still excited me weeks after I thought it up, meaning I totally needed to make it. A lot of times a recipe idea will come to me, but then doesn’t excite me long enough to stay. Either I’ll just forget about it, or by the time I’m ready to make it, I’m already over it. Recipes need to really excite me before I’ll even attempt to test them out. And this one? Well, I just knew it was a keeper. 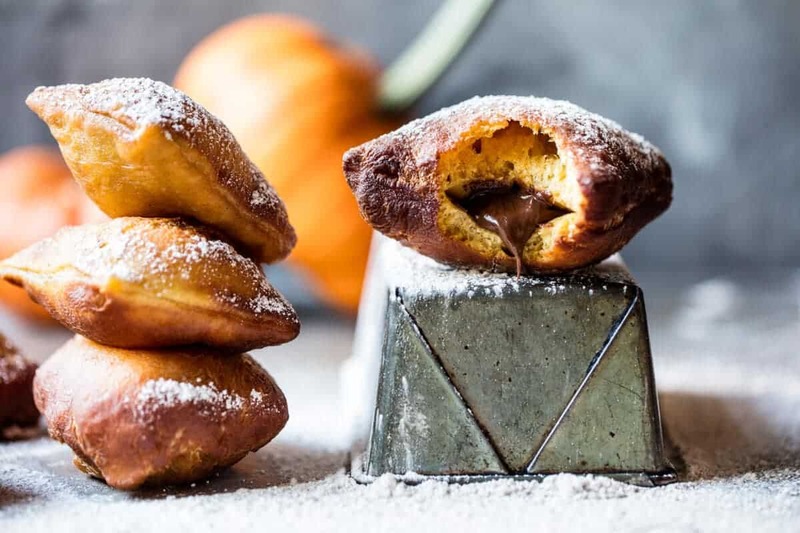 But then, how could anything pumpkiny and made with Nutella + fried dough not be delicious? 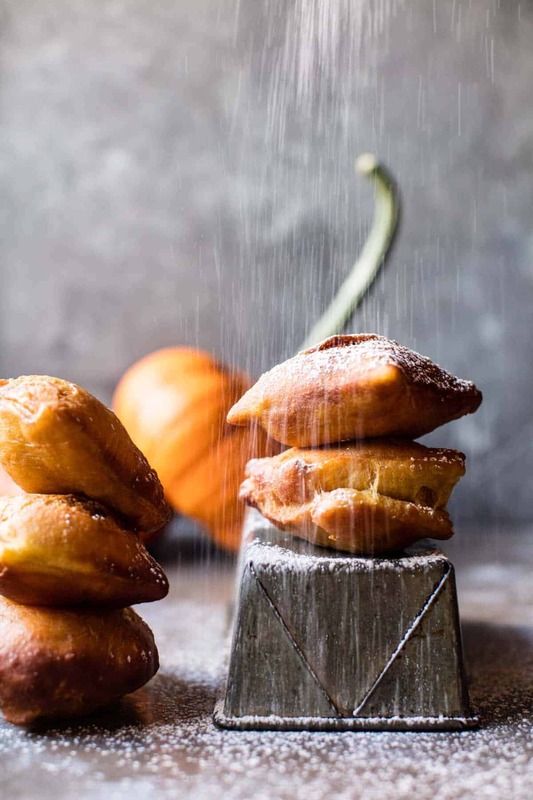 The dough is really simple, but what makes it special, and different from other beignet dough, is the addition of apple cider and pumpkin. 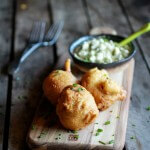 The combo screams fall, adds ample flavors and creates the most perfect light and airy beignet. 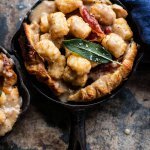 <–do you see those fried air bubbles…UGH – too good! 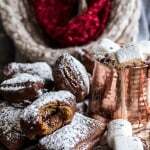 The best part though…the warm and gooey Nutella in the center of each pillowy, cinnamon dusted beignet…to die for! Now, I know these aren’t like super Halloweeny or anything, but that doesn’t mean you can’t make them this weekend and enjoy them as a sweet fall snack. OR maybe make them for Thanksgiving and literally impress everyone with your skills. OR…oh my gosh, pass them out to trick-or treaters?! You would for sure win my vote for best house on the block! Ah, unfortunately that probably won’t fly these days. 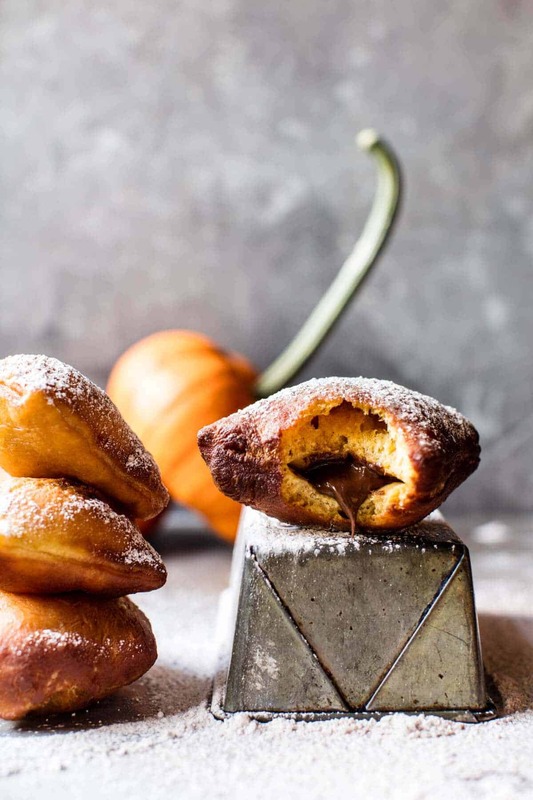 Come on though, let’s be real, who needs Halloween candy when you have NUTELLA Stuffed PUMPKIN Beignets?! 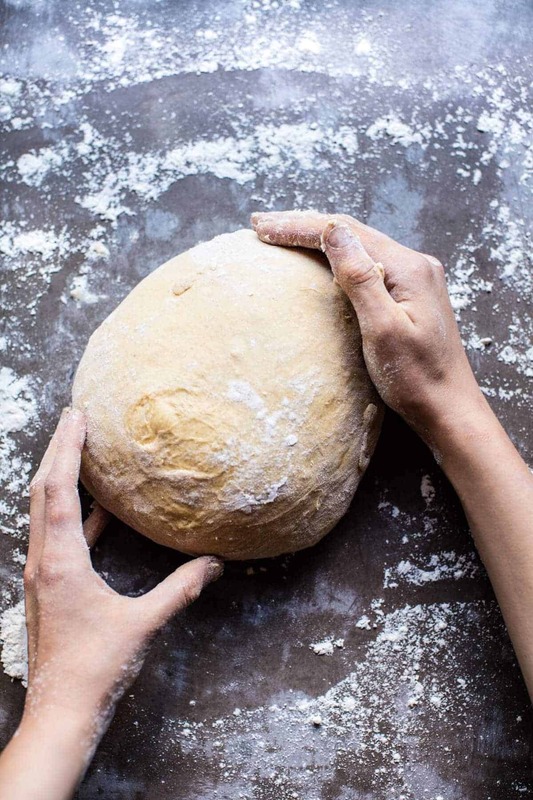 If you don’t have a mixer or would rather knead the dough with you hands, place the dough on a floured surface and knead until smooth, adding a little more flour as needed (about 8-10 minutes). The dough may still be a bit sticky, but shouldn’t be overly so. Mix the yeast, brown sugar, and warm cider in the bowl of a stand mixer fitted with the dough hook. Let sit for 5 minutes and allow the yeast to proof, it will foam up. Then add the eggs, salt, buttermilk, melted butter, pumpkin, vanilla, 2 1/2 cups flour, and 1 1/2 teaspoons cinnamon, mix on medium until combined. Continue slowly adding the remaining 1/2 cup of flour until it is all incorporated. The dough will be sticky. At this point begin adding 1 tablespoon of flour at a time until the dough pulls away from the sides and forms a smooth ball (about 4-6 minutes). Spray a bowl with cooking spray and place the dough inside, cover with some plastic wrap on top. Let rise for 1-2 hours in a warm spot, or until doubled in size. Turn the dough onto a floured work surface. Roll the dough out into a large rectangle, about an 1/8 inch thick. 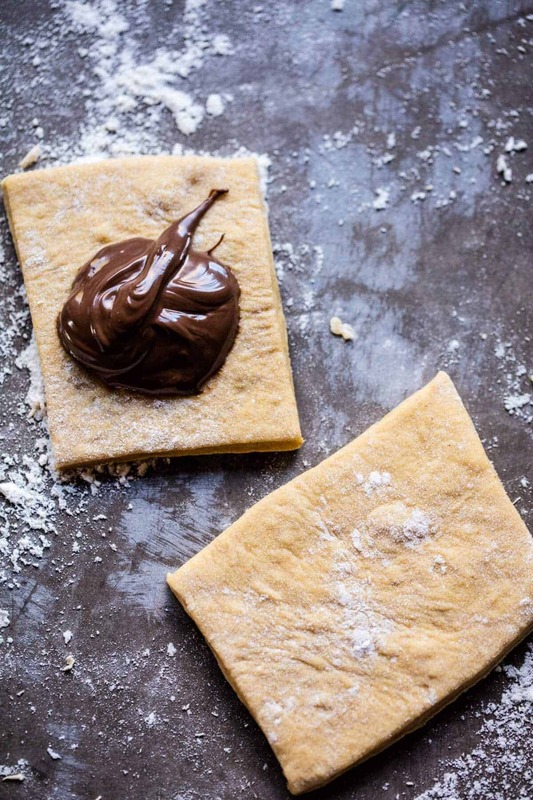 Use a knife or pastry cutter to cut into 3×3 inch squares (about 50 squares).Scoop out a scant teaspoon of Nutella and place in the middle of a square. Gently place another square on top and pinch the sides together. Fold each side in about 1/4 inch and pinch again. It is VERY important that the beignet is well sealed. If not, it could pop open while it fries and all the filling will spill out! Place a deep, heavy bottom pot on the stove and add enough oil to fill the pot about 1 to 1 1/2 inches deep. Turn the burner to medium and preheat the oil to 350 degrees F. Fry 4-6 beignets at a time depending on the size of your pot. Use a slotted spoon to flip them over every 30 seconds. Fry for 2-3 minutes or until golden brown on both sides. If they are taking longer than 3 minutes to brown you need to turn your burner up and make sure your oil is at the correct temperature. Remove with the slotted spoon and place on paper towels to drain. Repeat with remaining squares. In a small bowl, combine the remaining 1 tablespoon cinnamon and powdered sugar. Dust the warm beignets with powdered sugar on both sides. Hi!! Thank you!! I hope you got to try them and loved them!! Wow what a great idea these looks awesome! So creative to add pumpkin! Hey Rhian!! SO sorry I missed your comment somehow!! Thank you soo much! Couldn’t be more happy to hear you like them!! I’m pretty sure this must be considered criminal in some countries!!! THey look like a piece of heaven! SO excited for these pillows of yumminess to get in my life and also equally embarrassingly excited for Gilmore Girls!! Hey!! SO sorry for the late reply! Missed these comments somehow! I’m so excited!! And i hope you love the beignets!! Thank you! O.M.Goodness!!!!!!! These sound completely incred, Tighan! As if the title wasn’t enough to draw me in, then the photos…Love how you staged the first one up on the loaf pan. And then the sprinkling shower of powdered sugar. Ugh. I’m in love. Must. Try. To. Make. Them. Gluten. Free. Hey Donna!! SO sorry for the late reply! Ah thank you soo soo much! I really hope you got to make them!! Omg, yes!! This will be the best breakfast ever! I’m going to have to make these ASAP! Seriously cannot WAIT! Hey Andrea!! SO sorry for the late reply! Missed these comments somehow! Did you get to make them!? If so what did you think? These look so decadent and incredible!! Yum! I brought back a box of beignet mix from New Orleans but it just didn’t taste like those fresh ones or was it the atmosphere and great hot chocolate?? I will have to try these because I don’t think I’ll get back to New Orleans and these look oh so good. Hey Nancy!! SO sorry for the late reply! Missed these comments somehow! I hope mine don’t let you down! How were they? Did you get to make them? Hey Heather!! SO sorry for the late reply! Missed these comments somehow! I hope you got to make your own!! And loved them!! shut. it. DOWN!!!!! these look like little pockets of heaven, so yummy!!! SO sorry for the late reply! Hey Allyson! No i have not!! How cool, looking into that now! Thank you so much! Hope you are having a great week! ? Oh my gosh. 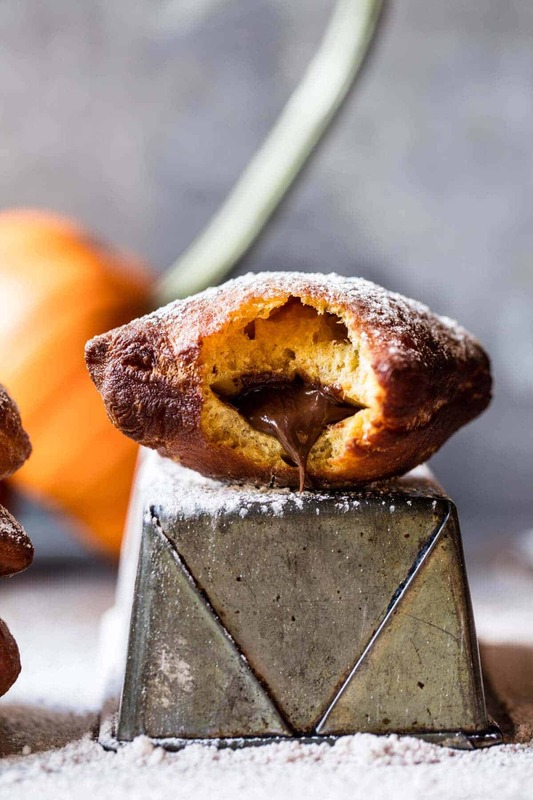 Nutella and pumpkin? Yes please. I just tried my first beignet in New Orleans this year, and my life will never be the same. I need to try these ASAP! Hi Christine sorry for the late reply!! YESS, can’t believe you just had your first one!! I hope you loved these!! Thank you! Hey Claire! SO SORRY! Yes, tablespoons is the way to go! 🙂 Thank you!! Hi Rebbeca sorry for the late reply!! So happy you like them!! Hi sorry for the late reply!! Thank you!! They look awesome! And the photo is great – it looks like there is a smiley face in the one that is cut open! Hi Kara sorry for the late reply!! Thanks so much!! SO happy you like them!! These sound like everything that is right in the world. Yum! Hi sorry for the late reply!! Thank you!! I’m so happy you liked them Brooklyn! I think I may be with your Mom Tieghan! These look incredible! Your photos are making me wish I could grab one right off my screen! Hi sorry for the late reply!! Thank so much girl!! So happy you like them!! These look absolutely delicious Tieghan! I’m constantly impressed with the amount of amazing food you turn out on your blog. Hi sorry for the late reply!! Thank you so much Shannon!! AH!! Hope you got to make them!! Of course having multiples! Thank you Amanda!! Not as pretty as yours , but mighty tasty! I’m sure they were! Thank you Jane!! Literally drooling over these fluffy clouds of heaven! 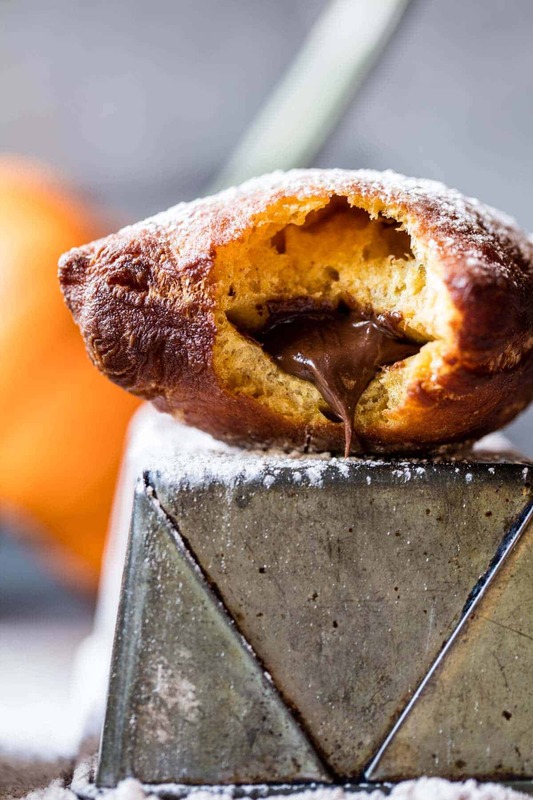 Nothing better than a pillowy donut stuffed with chocolate filling! Ah thank you! So happy you like them Bethany! These would make my Halloween absolutely perfect! Really hope you got to make them Matt!! Thanks!! And here I was thinking apple cider donuts were as good as fall got..WRONG! Need one of these asap! Haha! Thank you!! Hope you love it! What kind of oil do you use for frying? I’ve never fried anything before but I’d like to try making these! 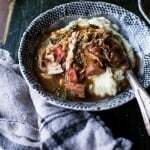 Do you use a metal slotted spoon or wood or what? Thanks!! Hey Lauren! I used canola or sometimes sunflower oil. I also use a metal slotted spoon, but wood would work too. Let me know if you have questions. Hope you love these! Thank you! Can these be made ahead of time? Have you tried freezing them? How do you recommend storing them? I’m so excited to try them! Hey Christina, unfortunately I do not recommend making these ahead of time as they are truly best eaten after fried. That said, leftovers are still good the next day! Let me know if you have questions. Thank you! I’ve just recently started seeing your recipes floating through my pinterest feed and boy am I happy about that! I love the way you answer your followers and the way you carry yourself in the comments. I tend to read EVERY comment prior to making a recipe. These look so good, I really need to invest in a fry daddy. Hey Jess! So happy you found my blog haha ? But thank you so much, and really happy you do read all of the comments because I answer a lot of questions about the recipe! Anyway, I hope you enjoy this one! SO happy you all liked them Kate!! Thank you so much!! I do not know anything about cooking/ baking and alcohol. So I am a bit worried if my two year old can eat them – without “getting drunk” ? Or will apple-juice (100% not watered down) be okay, too? Yes, its closest to an apple juice!! Hope you love it! I’m completely in love with these donuts, Tieghan! If you never tried the beignets from Disneyland, then you seriously missed out! However, these beignets look even better, so maybe not! XD I am so stoked to try making a veganized variety of this batch!